Waffles. Whenever I hear that word, I envision thin, crispy waffles, loaded with whipped cream and strawberry jam. Growing up, that is how I ate them. 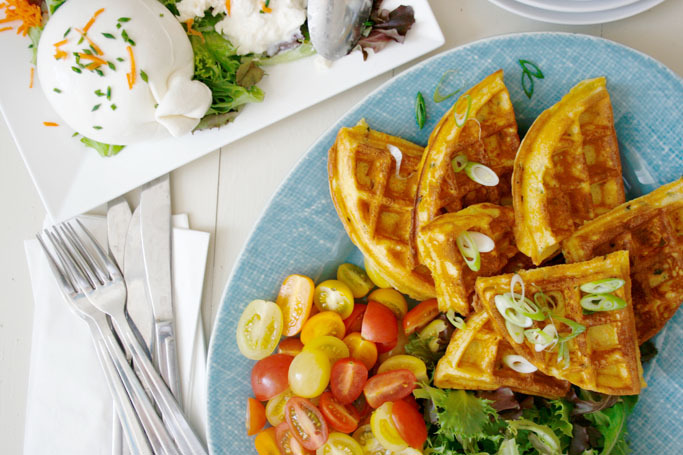 Today, waffles are more considered a dessert than a savoury dish but I like them both ways. They make a wonderful breakfast/brunch, whether sweet or savoury. 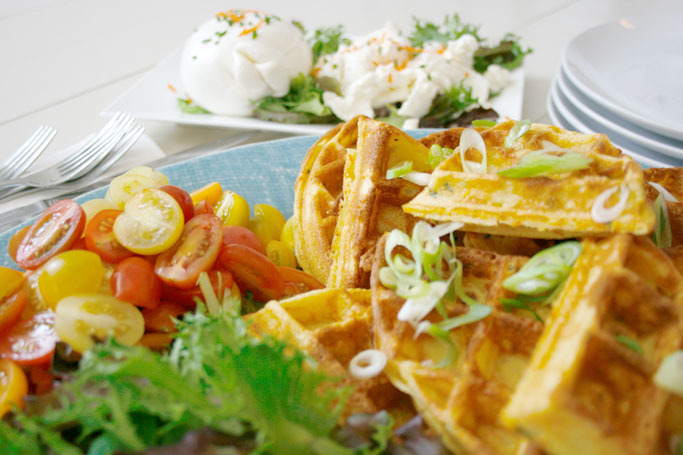 Recently, I made these savoury waffles for some friends staying for the weekend. They brought some fresh burrata as a gift and I was thinking of a way to put it to good use. 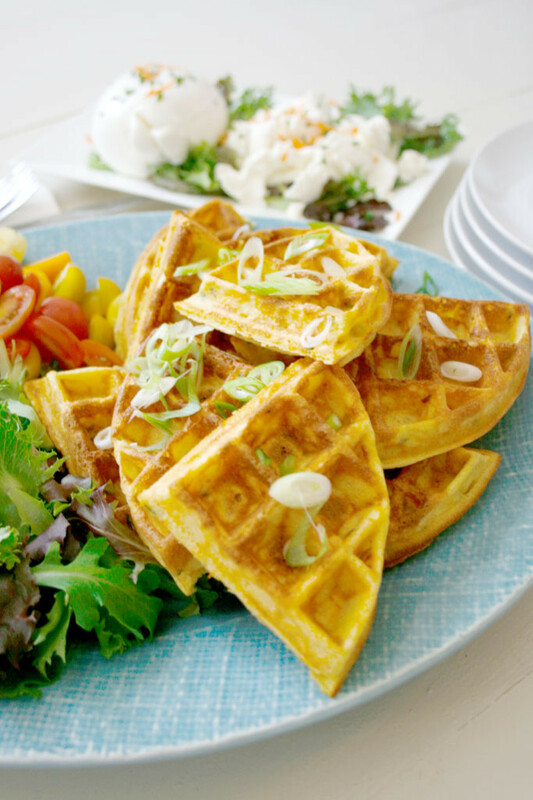 Adding some shredded carrots and chives to the waffle batter made them beautifully moist. 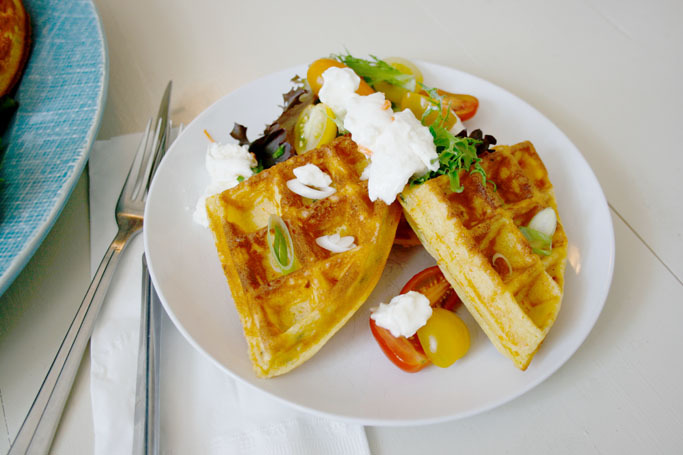 Mowing down on these warm waffles accompanied by fresh lettuce, tomatoes and a creamy burrata cheese I realize this is really is quite nice. I should do this more often—a big proper breakfast. Surrounded by cheers and laughter adds to the moment, but who needs guests for these anyway? So what if it is not a ‘special’ morning? Sometimes it’s important to treat ourselves a little. Think of something delicious to make and make this ordinary, nothing special morning, something to remember. In a large bowl, whisk together buttermilk, milk, sour cream and eggs. In a separate bowl sift flour, baking powder and salt. While whisking, slowly add the flour mixture, a little bit at a time, to the batter then whisk until well blended. Again, while whisking, add the browned butter and the chives and carrots. Stir well. Bake the waffles according to the instructions on your waffle maker. 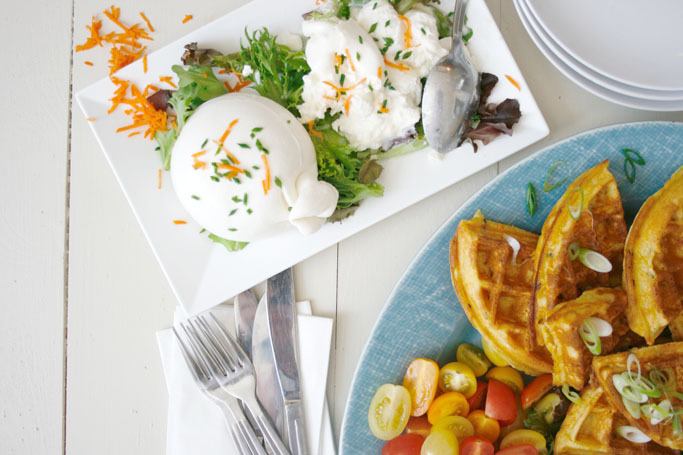 Transfer waffles to a plate in the oven to keep warm. Serve with a simple tomato salad and shredded burrata cheese, sprinkled with sea salt. “Can you make lunch today?” my mom asked one chilly morning while I sat down for coffee. “Sure!” I said, not really knowing what to make. My parents and I always divided up the cooking duties during my visits back home. This yearly sojourn in Sweden has become a veritable feast of new recipes to discover on top of my old favourites I still get to enjoy. Food is a huge thing for my family. Almost daily trips to the grocery store, planning and prepping. So much fun. I took a sip of coffee and we started to plan the day—plan the food. We were talking about soup. How we all love soup. All kinds. Savoury, sweet, hot and cold. It was the classic, Swedish split pea soup. Really? I thought. Perhaps she just hadn’t had a great version of it yet. Back in the middle ages, Sweden, while still a Catholic empire, Friday was a day of fast. 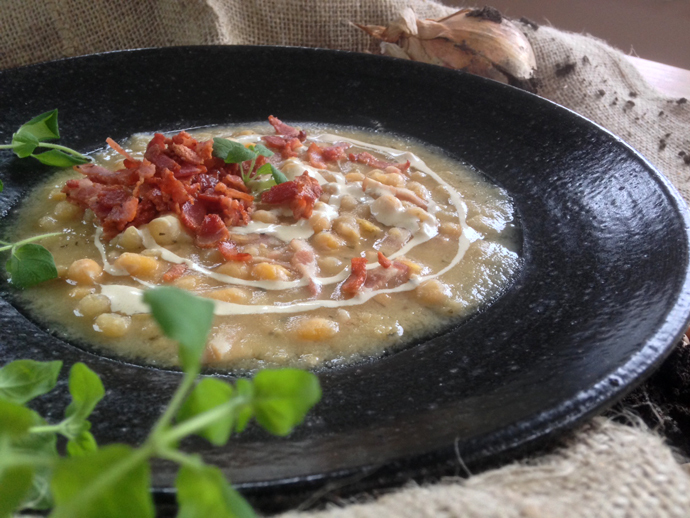 So, on Thursdays, people started making a hearty soup with yellow split peas, cooked in a delicious broth of pork and served with hard bread, mustard and cheese. Long after The Catholic Church lost its grip here, Thursday is still called ‘soup day’. Today’s Special in restaurants is often soup and most schools serve soup for lunch. Today was not Thursday. 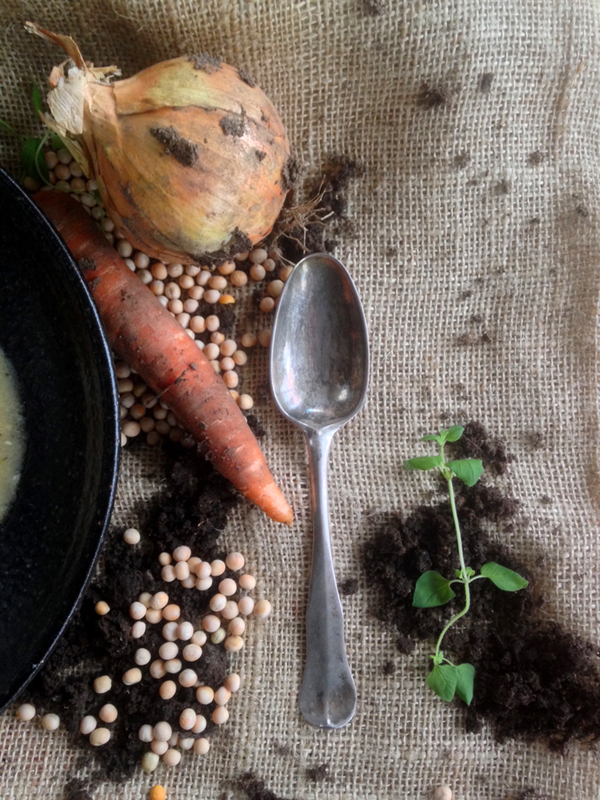 It was, however, a perfect day for hearty soup. This in mind, I jotted down items I needed to get for lunch. My mom, sharp eyed as ever, spotted ‘yellow split peas’ on the list. She looked at me. I looked at her, smiled and nodded. She smiled back. “I’m looking forward to it,” she said. I assured her she’d love it, all the while quietly praying I would be right. 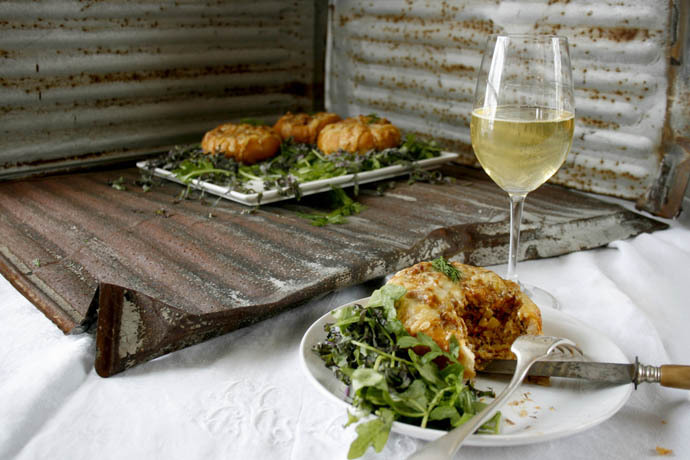 This is a very simple recipe—though a bit time consuming to prepare—the results are rustic and beautiful. My dad loves split pea soup, so I wasn’t worried about him. My mom’s verdict? Well, one wouldn’t take seconds if one didn’t like it, correct? Place the peas in a large bowl and fill up with water. Leave to swell for 6-12 hours. Drain the peas and transfer to a large sauce pan. Add most of the water. Cut the carrots in 2″ pieces and peel and quarter the onion. Add to the pot along with bay leaves. Bring to a boil and let simmer, uncovered for 30 min. Fold half of the bacon in half and tie together with kitchen string. Add along with the rest of the spices and let simmer for another 30 min. Stir once in a while and add water as needed. Remove the bacon and set aside. Let the soup cook until the peas are soft and starting to break down. In a frying pan, fry the rest of the bacon until nicely browned and crisp. Cut into small pieces and place in a serving dish. Remove carrots, onions, bay leaves and allspice corns from the soup. Cut the bacon from the soup into small pieces and add back to the soup. In a bowl, mix together mustard, creme fraiche, salt and pepper. 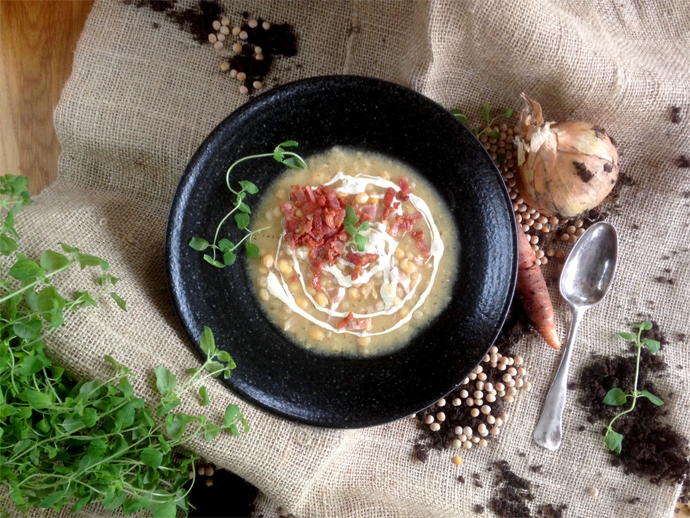 Decorate the hot soup with a dollop of mustard crème fraîche and sprinkle with fried bacon. 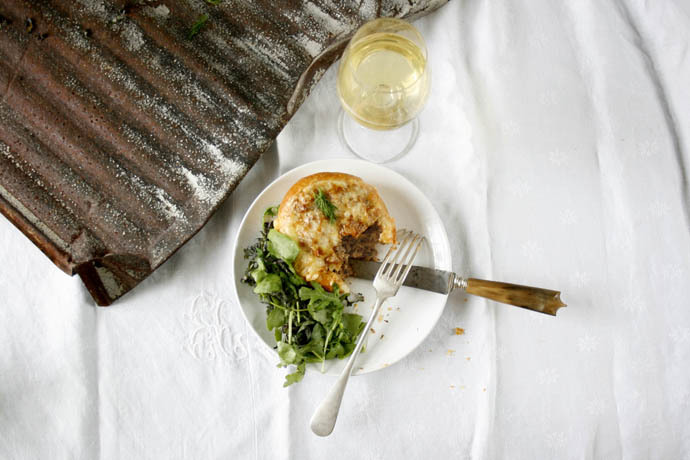 Serve with crisp bread, butter and Havarti cheese. 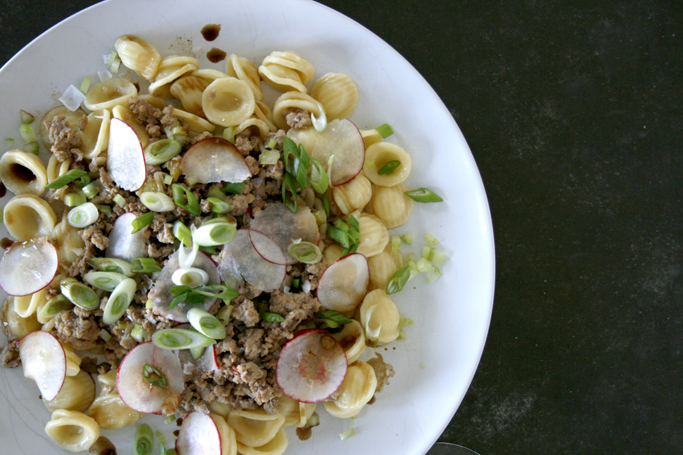 This is a perfect cold and rainy or snowy lunch dish. I discovered it years ago flipping through one of my moms old food magazines. It was just a day like today. Dark and gloomy. The kind of day where you really don’t want to get out of bed. Howling winds and rain hitting the roof is anything but inspiring. Not much can be done about it. So, why not put on your comfiest of clothes and spend the day in the kitchen? That’s what I usually do. The original copy I had of the recipe for this dish is long gone but this is how I remember it. I have to admit, horseradish and dill in a ground beef mixture was something new to me. It does work really well. I may have brought up the spice level a bit from the original, but tastes do change with time. I find dill a very underrated herb. It’s not often used unless with fish or seafood. Another dill and meat dish that I love is a Swedish classic: Lamb cooked in a dill sauce. I have a feeling it will be featured in its own post in the not so distant future. 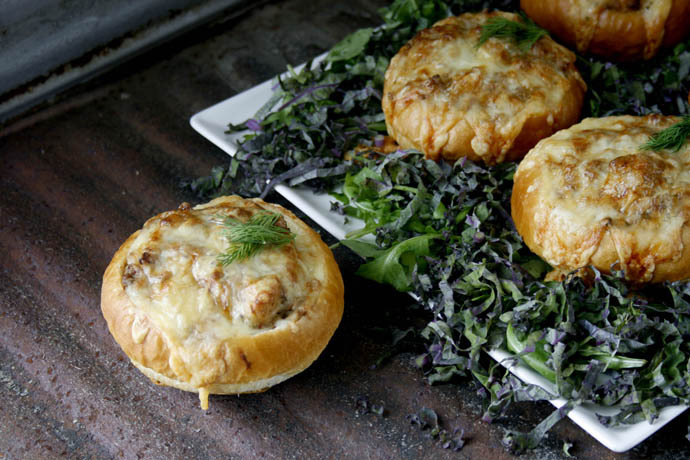 But until then, why not try these crunchy, creamy and full of flavour buns. You’ll love them. Peel and finely dice the onion, garlic and zucchini. In a large cast iron pan, heat up the butter and olive oil. Fry the ground meat over medium-high heat until browned. Brake it up well with a wooden spoon and stir often. Transfer the ground beef to a bowl, but leave the juices in the pan. Add the onion, garlic, zucchini, horseradish and ginger to the liquid and sauté for 3-4 minutes. Stir often. Pour the beef back into the pot and add mustard, tomato paste, sambal oelek (or other hot chili sauce), dill and water. Season with salt and pepper. While the beef is simmering, cut the top of the buns, about 1″ from the top. Scoop out some of the centre and chop it into small pieces. You should have about 1 cup of diced bread. Add to the meat sauce along with the crème fraîche. The filling should be fairly dry to prevent the bottom of loaf/buns getting soggy. When well mixed, add the filling. Let it mound a bit. Sprinkle with freshly grated cheese (I use a mixture of mozzarella and gruyère). 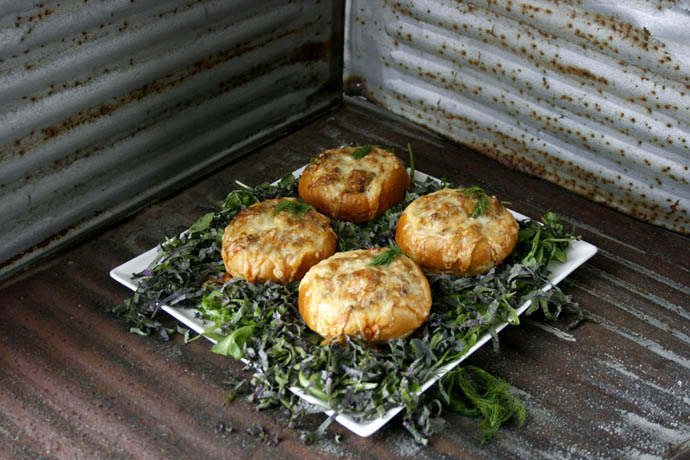 Bake in the upper part of the oven for 10-15 min until cheese is melted and nicely browned. Enjoy with a green salad. 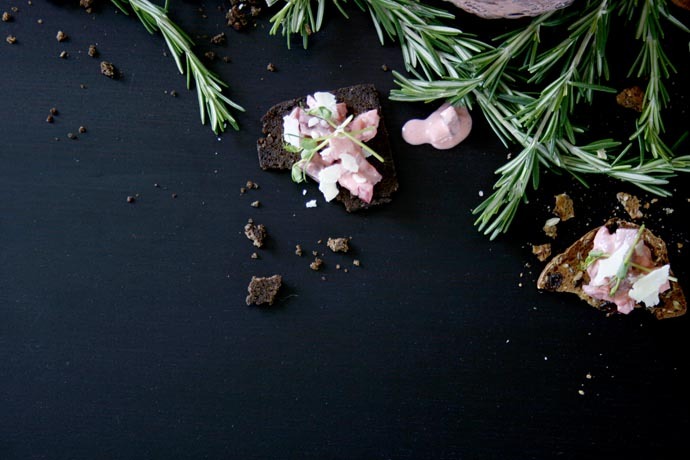 Christmas in Sweden is all about food. 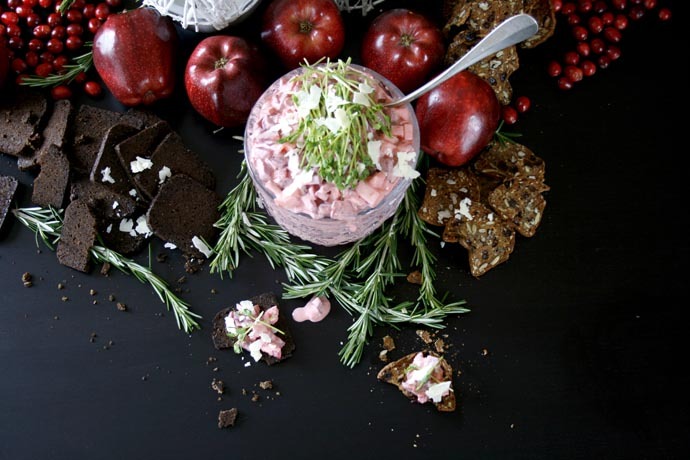 Traditional Swedish Christmas buffets are found in most homes and eating establishments. 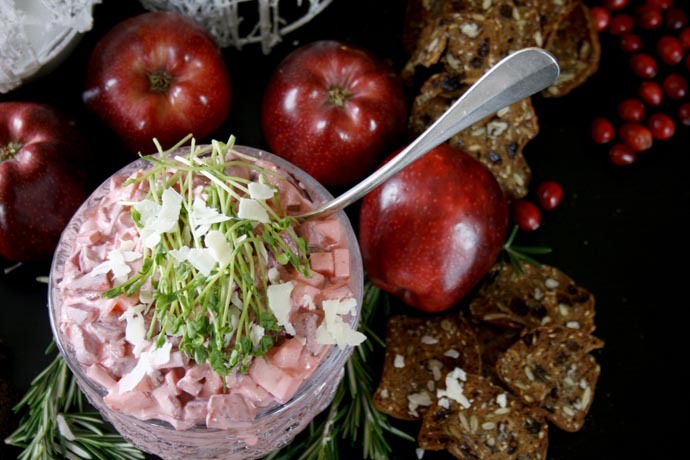 Beautifully decorated with cranberries, red apples and rosemary, overflowing with all kinds of goodies. Pickled herring, omelettes with mushroom béchamel, Christmas ham, gravlax, meatballs, cooked red cabbage, Jansson’s temptation, cheeses, sausages, soft and crisp breads only to mention a few. Traditionally you go back to the table several times, each time grabbing different items. In good company, you’ll be eating for hours. This beet salad is another member of the buffet table. 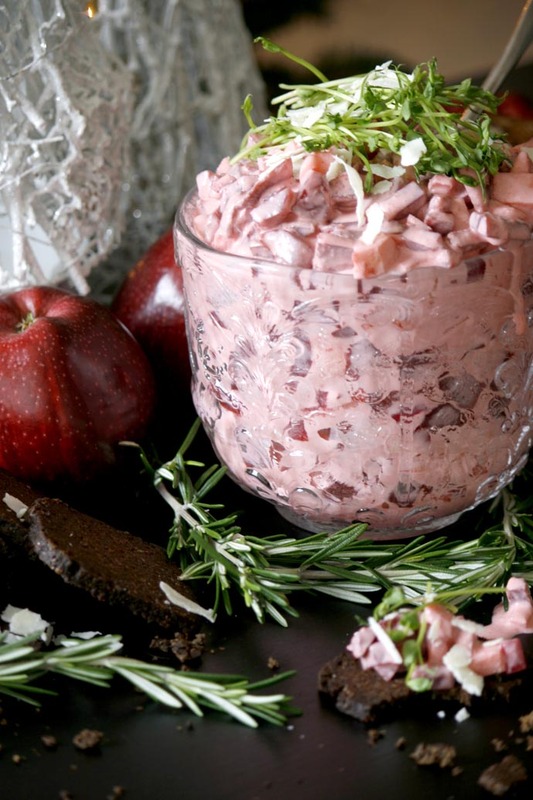 Pickled beets, apple and red onion tossed in a crème fraiche and mayonnaise sauce with a touch of mustard. How simple is that? It will take about 10 minutes to assemble and it will add a lovely punch of colour to your table. 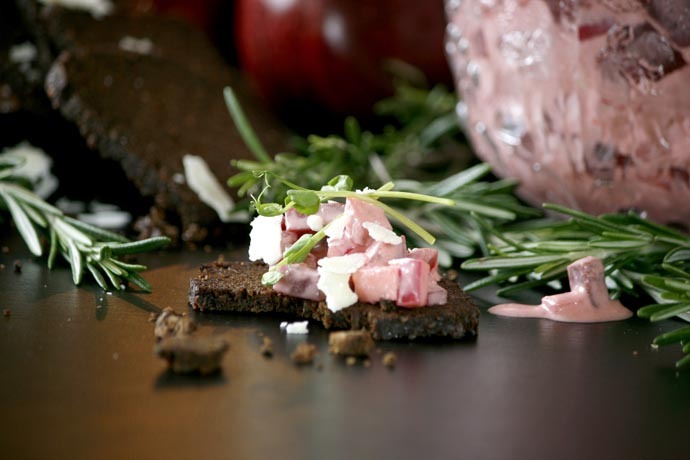 Even if not planning a full fledged Swedish Christmas buffet this season, this beet salad would be a great side dish addition to any dinner table. I also love serving it as an hors d’oeuvre on crackers. Cut the beets and apples into 1/2” pieces and add to a bowl. Finely dice the red onion and add to the same bowl along with the rest of the ingredients. Mix well. Cover in plastic wrap and let sit in the fridge for a few hours, preferably over night to marinate. Stir occasionally. 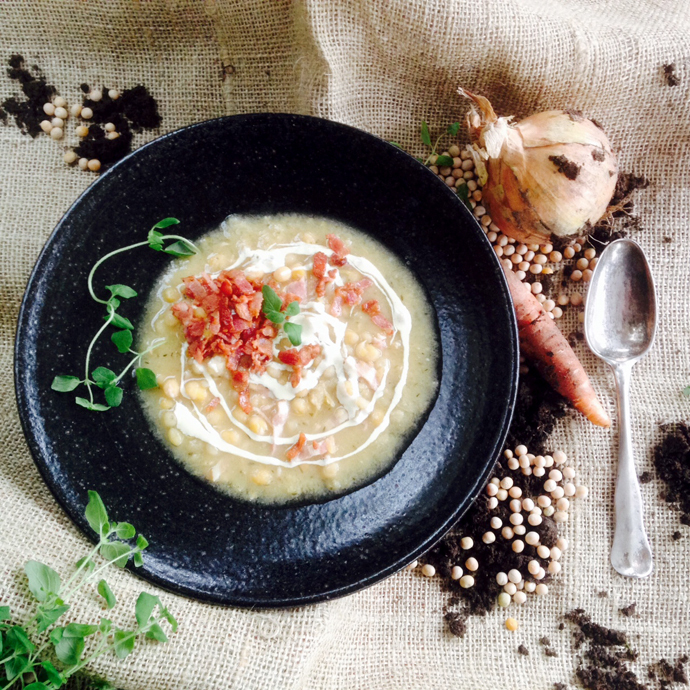 I’ve said it before and I’ll say it again: Soups are great. 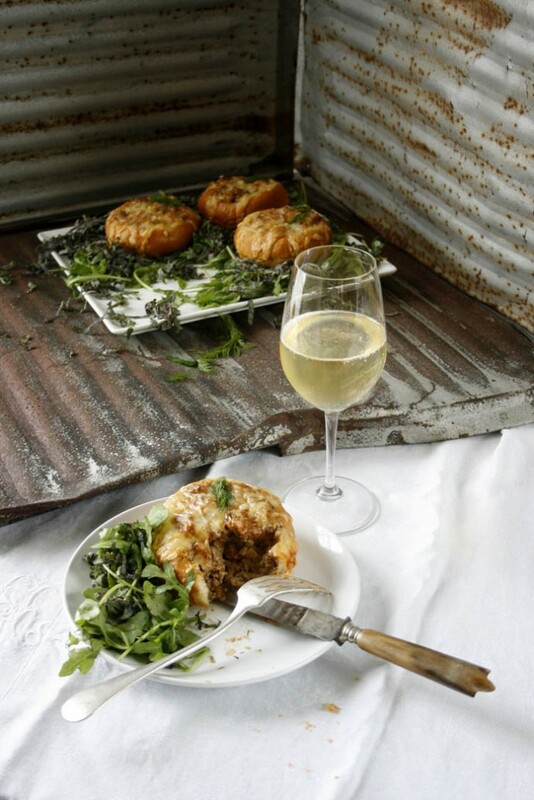 They are easy to make and a good food option for all seasons. Warmer weather calls for cooler versions. 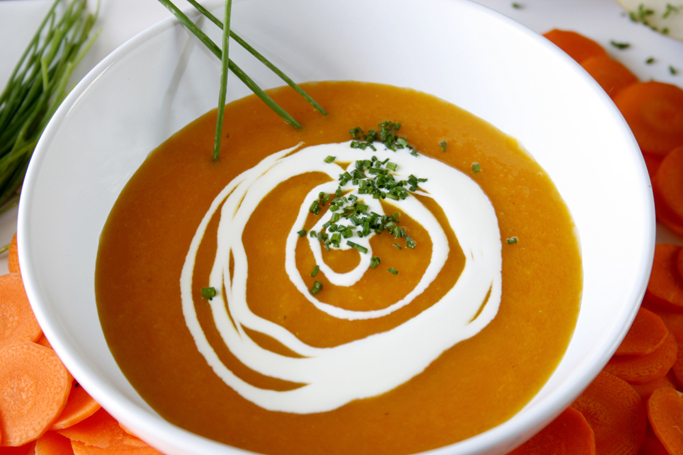 When winter sets in, you want to nestle up with in a blanket and a steaming bowl of your favourite soup. Such a marvellous way to warm up. 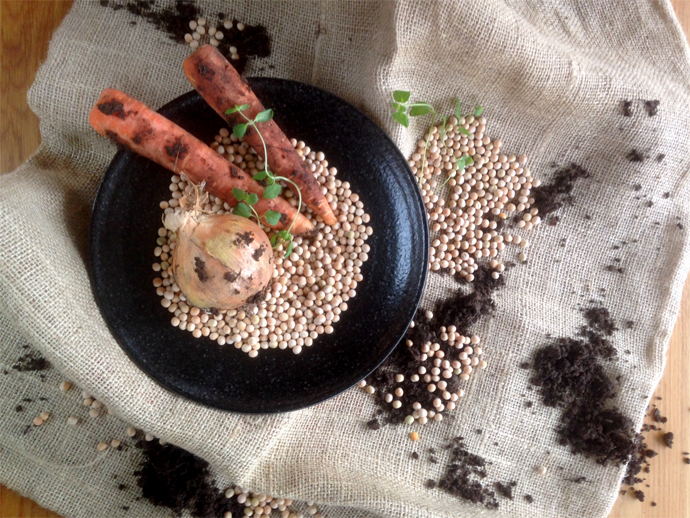 Recently I needed a reason to use up a big chunk of the carrots in our garden. Soup came to mind. 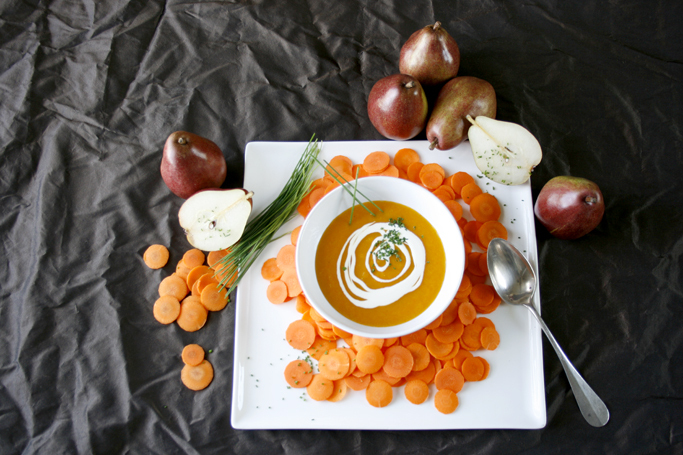 Who wouldn’t love a bright orange soup made from freshly picked carrots? 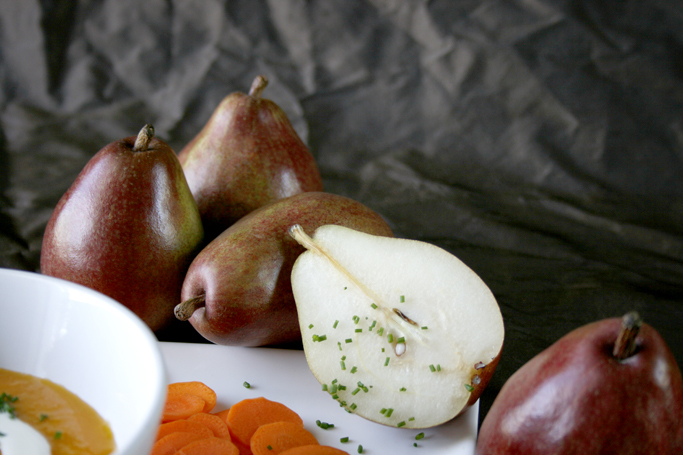 Whilst pureeing the soup, a bowl of pears on the counter caught my eye. Hmmm. Well why not? I grabbed a few and quickly peeled and cored them berfore tossing them into the blender as well. Delicious. 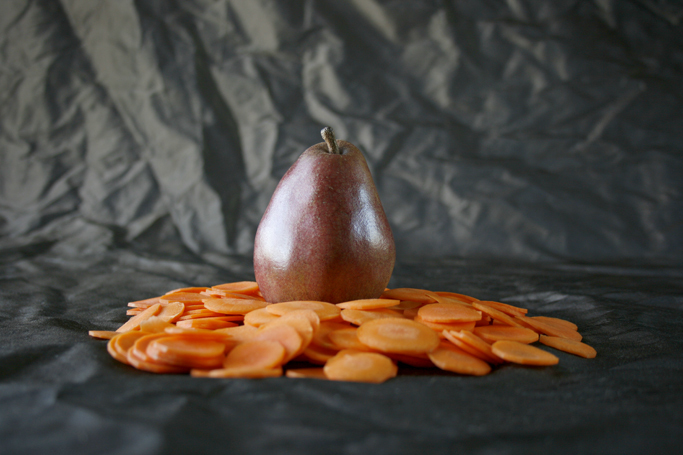 The vibrant colour and subtle taste of carrots went seamlessly with the fresh hint of pear. I do love when I hear a symphony of “mmmm’s” around the dining room table. It is one of those simple pleasures in life I never tire of. This time around it was with each spoonful. This recipe is a keeper. Equally as good warm as chilled. Peel the carrots and onion and cut into 1” pieces. Peel and lightly crush the garlic cloves. In a large pot, over medium high heat, heat up butter and olive oil then sauté the vegetables for 3-4 minutes. Turn the heat down to medium and add the eau de vie. Let cook for a minute, stirring the bottom of the pot. Add the chicken broth. Bring to a boil, then let simmer until carrots are soft, about 20 min. Take off heat and let cool slightly. In the mean time, peel and core the pears. Cut into 1” pieces. Add to a blender. Transfer the soup to the blender as well and pure until smooth. 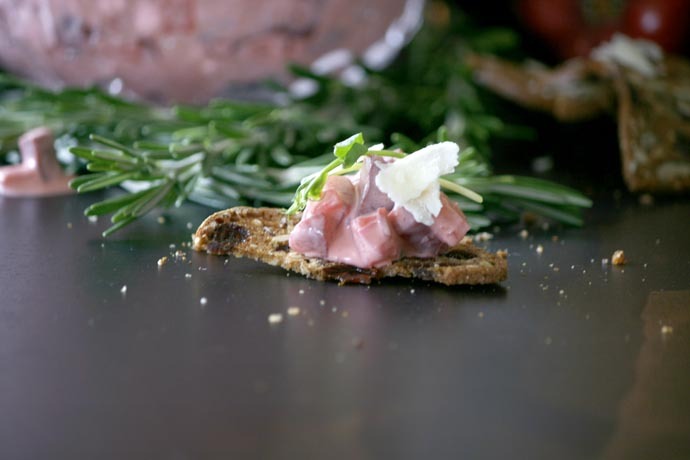 Garnish with a dollop of crème fraîche, some finely diced chives and a sprinkle of sea salt. A few weeks ago I squealed with joy as friends of ours dropped off a big bag of freshly cut asparagus from their own garden. 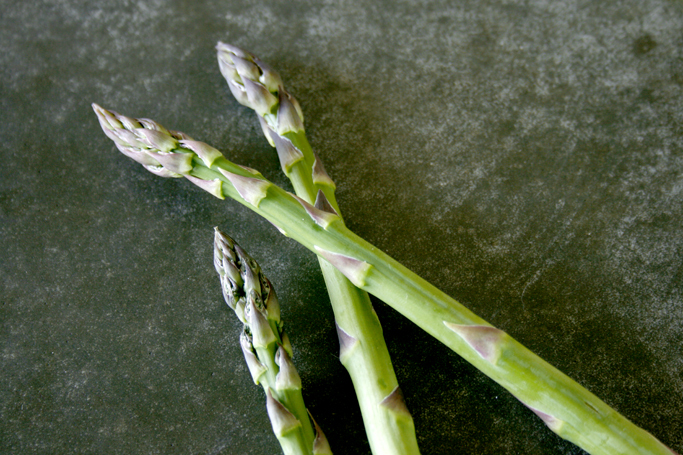 I get this tingling feeling in my whole body every spring when I know the asparagus is ready and the local farm stands will soon begin displaying these bundles of bright green beautiful stalks. A true perk to live out in the country. For me it’s the best part of the year. The kick-start for the fresh produce season. I fully indulge and eat as much asparagus as I possibly can during its rather short span and I’m sure I’m not the only one. 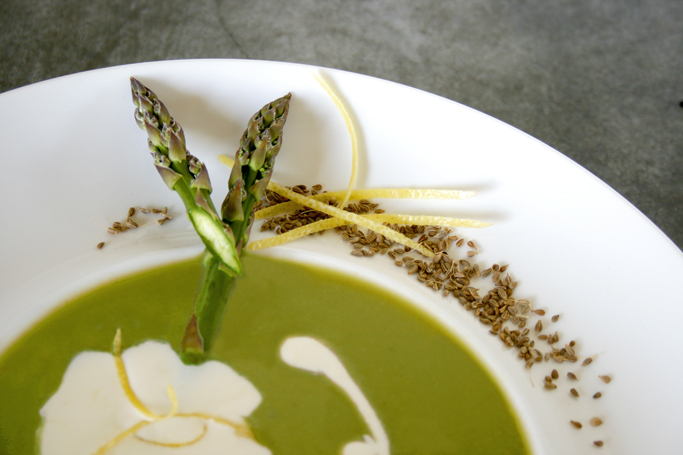 The great thing about asparagus is that there are endless ways to prepare it. 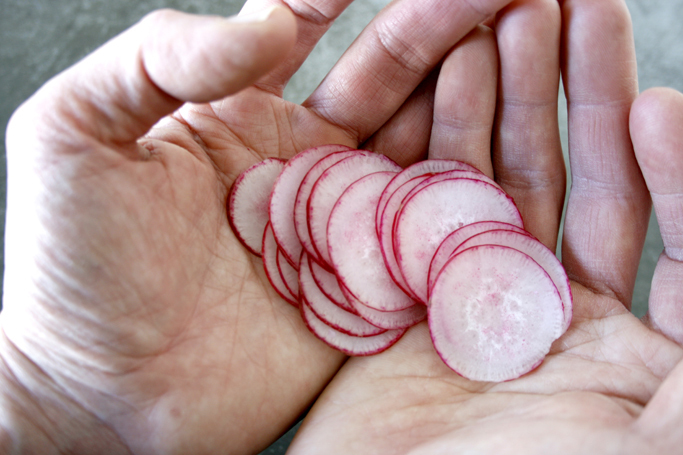 Fry it, cook it, steam it, roast it, bbq it, puree it, eat it raw – the list goes on and on. 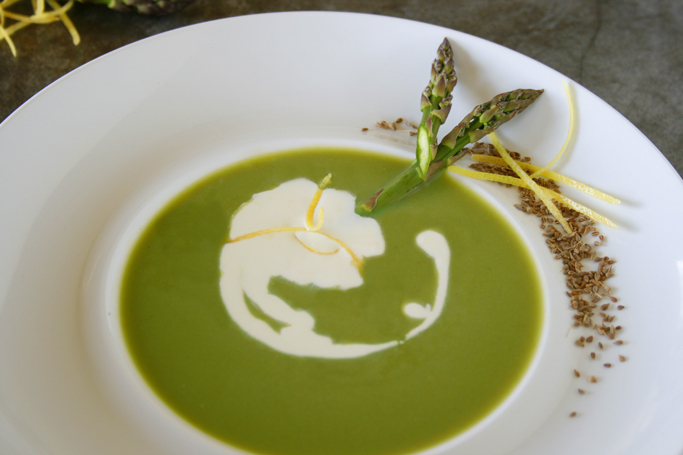 One of my asparagus favourites is this oh so simple bisque. It’s delightful both hot, room temperature or slightly chilled, depending on the day. 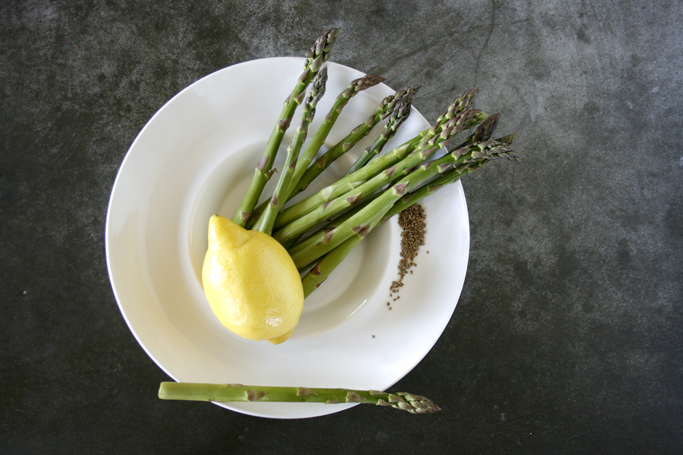 The asparagus takes centre seat while nicely backed up by fennel and cumin. A dollop of lemon crème fraîche tops it off. 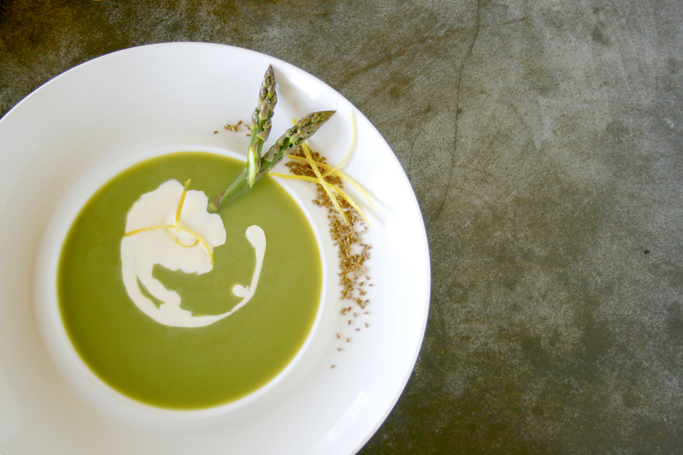 The bisque can be made a day in advance to make your lunch or dinner as enjoyable as possible. Perfect. Cut off the bottom 1” of the asparagus and cut them in 2” pieces. In a large heavy sauce pan, melt the butter with the olive oil. Sauté the shallots until soft ~ 5 minutes. Add the garlic, asparagus and spices and cook for another minute. Pour in the chicken broth and bring to a boil. Turn the heat down and let simmer until asparagus is soft, about 10 minutes. Let cool before transferring the soup to a blender. Purée for a couple of minutes or until very smooth. Pour soup through a sieve into a large bowl. Use the back of a ladle in the sieve to push the liquid through. Discard the solids. Mix together the lemon juice with the crème fraîche and decorate each serving. Garnish with the lemon zest. Serves 4. I adore pasta. Perhaps I was Italian in a previous life? Who knows. Something I would bring to a deserted island? Definitely. It’s convenient. Something to fall back on when peeling a pot of potatoes seem like an enormous task. It comes in a large varietal of shapes and forms. I have my favourites of course. Orecchiette is being one of them. Bruno gets his fair share of pasta when I’m cooking although he is not as fond of it as I am. Don’t take me wrong, he likes it. I love it. 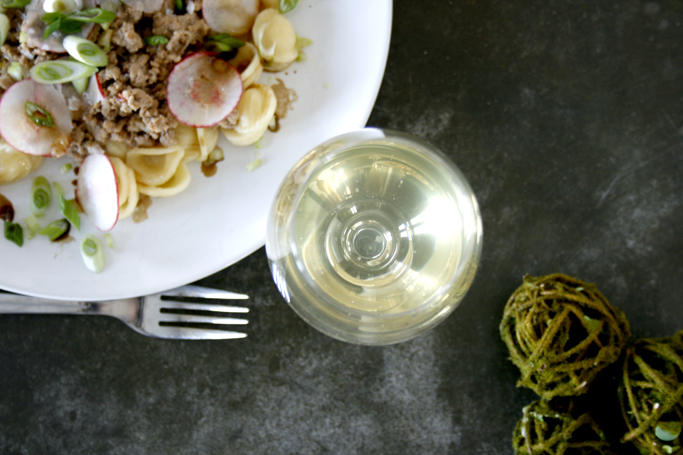 In this recipe I use ground pork rather than ground beef. 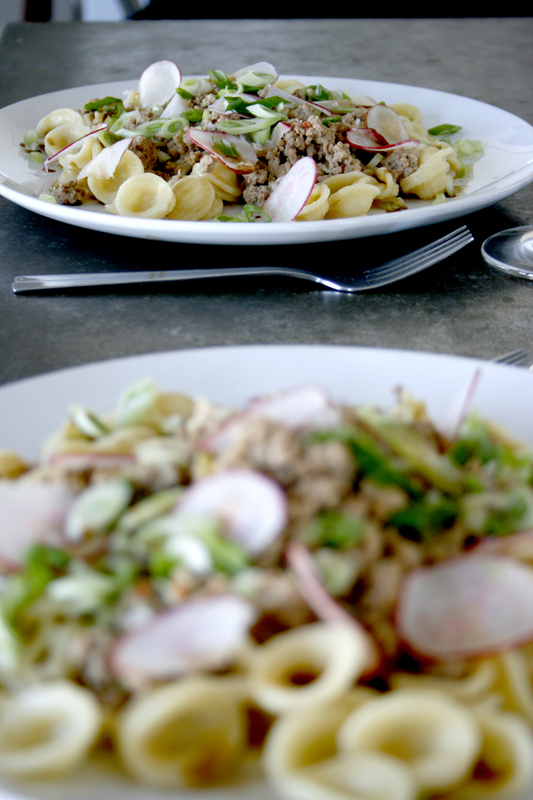 The more subtle flavours of the pork allows the other ingredients to pop. A great dish whether it’s snowing or sweltering outside. 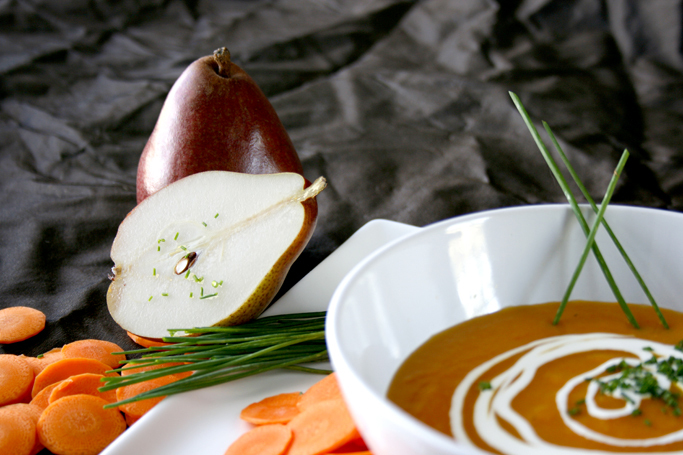 It goes amazingly well with our Golden Russet Apple Cider! Finely chop the vegetables and put aside. In a frying pan, heat up the butter and olive oil. Fry the ground pork on medium heat until cooked. Add the soya and Worcestershire sauce along with the vinegar. Let simmer until liquid is reduced by half. In the meantime cook the pasta until Al Dente. Drain. Add the creme fraiche and sambal oelek along with some ground pepper to the pork and stir well. Toss with pasta, or serve separate. 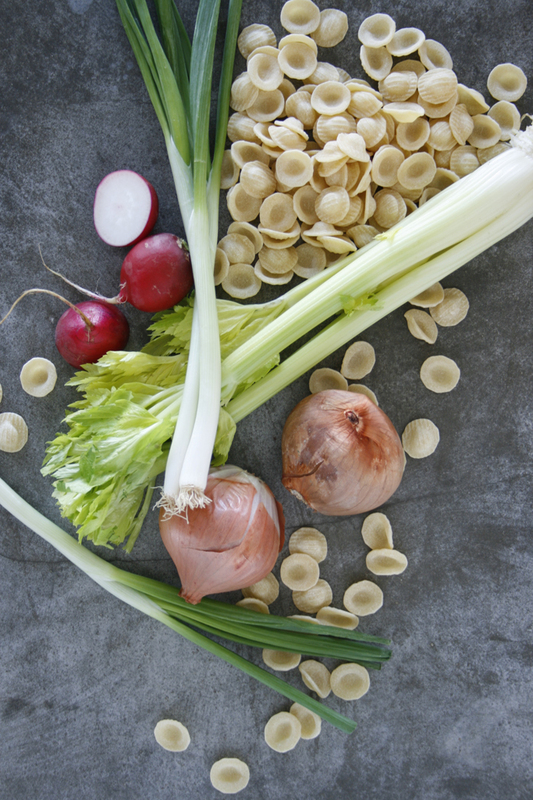 Sprinkle celery, radishes and green onions on top. Serves 4.